ok, i need help again. I installed noto hud to see that the target id bg does not load properly. what are some of the files that you need to look at to fix it? "PlayerStatusHealthBonusImage" in HudPlayerHealth.res is set to "visible" 0 and "enabled" 0, so you'd have to re-enable it. You might have to mess with PlayerStatusHealthImage for the bonus, but try it without re-enabling it first, I'm not sure. Also, can anyone tell me where to edit where the Contracts Drawer window pulls up on the screen when you open it? I was able to find the notifications and MOTD panels when they are displayed, but I could not find anything for the contracts. Mochaaaaok, i need help again. I installed noto hud to see that the target id bg does not load properly. what are some of the files that you need to look at to fix it? A screenshot of what you mean would help to understand your issue. Also, can anyone tell me where to edit where the [url=http://i.imgur.com/6b5hmEq.jpg]Contracts Drawer[/url] window pulls up on the screen when you open it? I was able to find the notifications and MOTD panels when they are displayed, but I could not find anything for the contracts. in arena, the target IDs move up on your hud for some reason. you could go into your scripts/hudlayout.res file and mess with the ypos of CMainTargetID and CSecondaryTargetID, but usually hud makers try to make the top of your screen as least cluttered as possible so you can see jumpers. it's all preference in the end though. your text box isn't wide enough, try increasing the "wide" value. There's a console command that controls the alpha of the target id background, tf_hud_target_id_alpha. Set it to 255 and the backgrounds will look full. I dunno why static was going on about where the target id is positioned but ??? Where can i edit the medics shield meter (mvm) ? Jason_HeyWhere can i edit the medics shield meter (mvm) ? Unfortunately thats not it. Im using flathud and try to fix the shield meter clipping with the uber bar, so i changed the x and y pos in huditemeffectmeter_heavy.res (the first block) and it only affected the rage meter and left the shield meter untouched. Jason_HeyUnfortunately thats not it. Im using flathud and try to fix the shield meter clipping with the uber bar, so i changed the x and y pos in huditemeffectmeter_heavy.res (the first block) and it only affected the rage meter and left the shield meter untouched. huditemeffectmeter_scout.res is what you're looking for to change the shield meter. Nokk Jason_HeyUnfortunately thats not it. Im using flathud and try to fix the shield meter clipping with the uber bar, so i changed the x and y pos in huditemeffectmeter_heavy.res (the first block) and it only affected the rage meter and left the shield meter untouched. Which files should I look at for editing the health bars and outlines of my teammates (the ones I see when I'm dead and shortly after respawning)? EnderpWhich files should I look at for editing the health bars and outlines of my teammates (the ones I see when I'm dead and shortly after respawning)? Disabling the health bars/names is setting visible to 0 in hudlayout.res for 'SpectatorExtras', outlines are controlled by console variables. Btw, where is this text file located? Whenever I join payload maps any map my hud breaks. I can't click continue on the map rotation screen and it looks like the default hud. If I hit enter on my keyboard, I can go to the team selection screen, but again I can't click anything and it's the default hud. This continues to the class selection screen (cant click/default hud). In-game I have my custom hud except for the spectator screen (when dead) is the default hud. It's been like this for a couple of weeks now. Whenever I join [s]payload maps[/s] any map my hud breaks. I can't click continue on the map rotation screen and it looks like the default hud. If I hit enter on my keyboard, I can go to the team selection screen, but again I can't click anything and it's the default hud. This continues to the class selection screen (cant click/default hud). In-game I have my custom hud except for the spectator screen (when dead) is the default hud. how do i fix the red team panel thing on the right from being cut off? I'd like the health cross and number above the player's head to be about 4x larger to make it more visible, and the TargetID cross/number to be 2x bigger. The background box will probably have to be increased to compensate as well. I tried tinkering with spectatorguihealth.res but that didn't work out too well. Also, it bothers me that the overheal cross jumps to max size regardless of how much overheal and stays that way until health goes back down to normal, then the overheal cross disappears, rather than slowly shrinking. Is there a way to fix this? It behaves normally on TargetID but not above the player's head. And finally, I want to center the vaccinator's resistance icon. In HudMedicCharge.res, I set the wide and tall values to 70 for good visibility, but the xpos and ypos dont seem to affect the position. How do I change the layout of the main menu and the picture/background of the main menu. Also how do i move the in game scoreboard up or down when I press tab. Is it possible to have a larger font size? Somewhere around a tall value of 64 the text size doesn't appear to get larger. I would like to have a font size that almost fills up the entire screen. omni Mochaaaaok, i need help again. I installed noto hud to see that the target id bg does not load properly. what are some of the files that you need to look at to fix it? Impossible to have the above the head and the targetID sized differently. In TargetID find spectatorguihealth and change "HealthBonusPosAdj" to it's default value of 10 and the HealthDeathWarning to 0.49 and see if this improves the issue. Have a look at this thread explaining an 'anchor' trick with 'pin_to_corner' to move elements that seem fixed in the hud. Professor_Salty_ScrubHow do I change the layout of the main menu and the picture/background of the main menu. Also how do i move the in game scoreboard up or down when I press tab. Have a look at Scoreboard.res? Have a look at [url=http://rebelconquer.net/thread/22722/vaccinator-resist-icon-fix/]this thread[/url] explaining an 'anchor' trick with 'pin_to_corner' to move elements that seem fixed in the hud. I'm using ahud and I want to get an outline around the borders of the item selection screen. If anyone knows how I'd appreciate it. mylosercanflyI'm using ahud and I want to get an outline around the borders of the item selection screen. [quote=mylosercanfly]I'm using ahud and I want to get an outline around the borders of the item selection screen. Wiethoofd MR_SLINHow would I fix the MvM portion of a HUD? I'm trying to revamp an old HUD and the MvM part is broken. 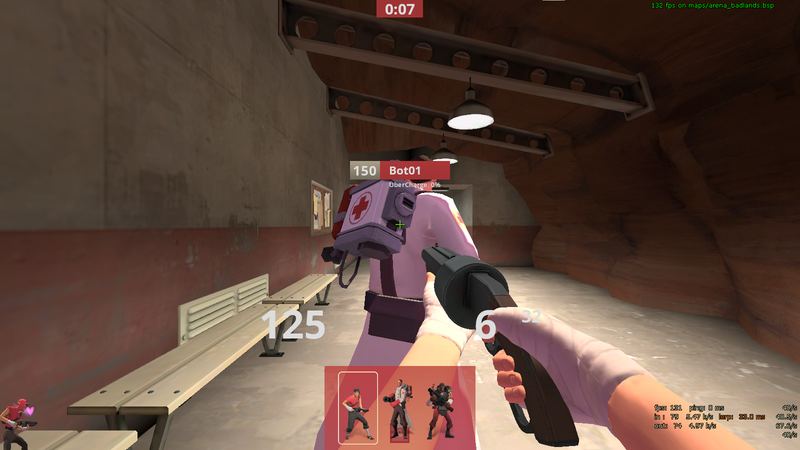 I'm happy to play MvM with default HUD (i.e. install default MvM HUD into this revamped HUD), I just want to have a working MvM HUD. 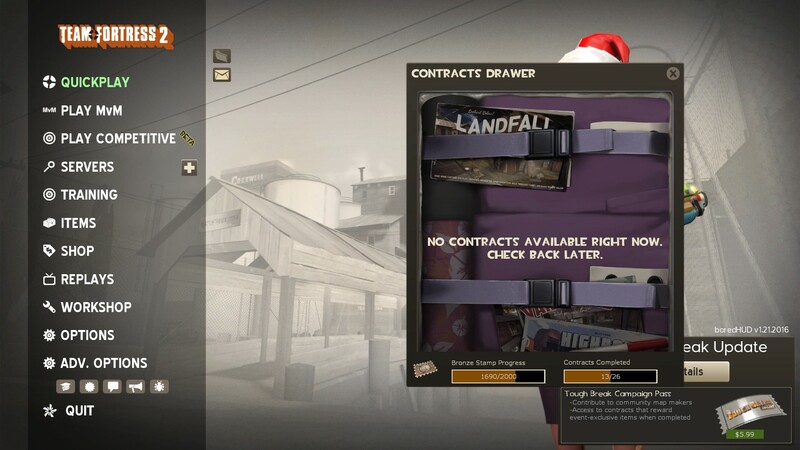 I'd also be willing to rip the MvM HUD from an existing custom HUD. Sorry for the late reply. I'm not sure what you meant in that last sentence (local server what?) but my MvM hud doesn't have a hud thingy to ready up (which is causing an issue when I'm trying to see ready statuses in PugChamp), I don't have an objective UI (i.e. where the bomb is) and my scoreboard is broken as you mentioned. I can try your scoreboard fix though!